GNSI has many local chapters that build community and provide professional development opportunities. 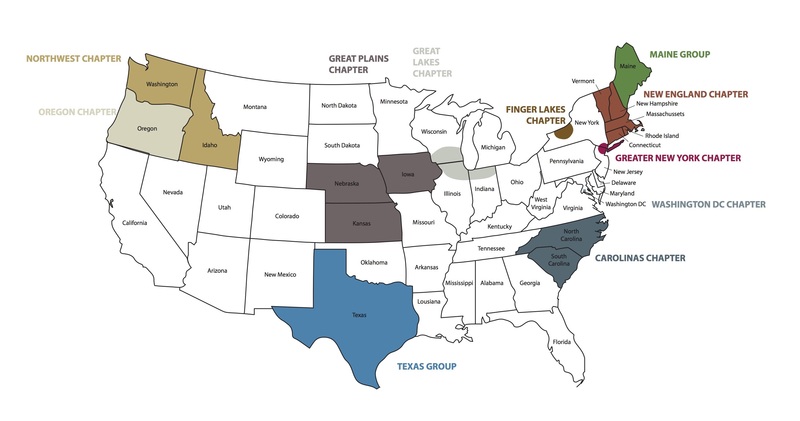 Chapters bring regional members together, host local events such as lectures and field trips, and facilitate networking through their web presence and social media. Regional members and others interested in science illustration can also form informal GNSI Groups to gauge interest in forming an official GNSI Chapter. GNSI will gladly promote local organizations and aid in advertising programs and events, but Groups and their events are not eligible for liability coverage under our national insurance policy. New members, especially students, can more easily find the GNSI and become involved in the issues that concern our profession. The core GNSI-Carolinas group is in the central NC Triangle area of Raleigh, Durham and Chapel Hill. We meet about four times per year for our programmed meetings at the lovely North Carolina Botanical Garden in Chapel Hill, NC, part of the University of North Carolina at Chapel Hill, NC. A number of our members are graduates of the Garden’s excellent Botanical Illustration Program of Studies. We are a diverse group, with a variety of backgrounds from amateur artists just starting out to professionals and scientific illustrators! We try to engage presenters who instruct us in new techniques, with an emphasis on botanicals. We also have one annual program in which our members update one another on their artistic ventures of the year, exchange materials, and enjoy a potluck dinner. In addition to our four program meetings, we have a Spring Workshop, often held at NC State College in Raleigh; a Fall Retreat held either in the mountains or at the beach in NC; and frequent sketching outings. The New England Chapter of the Guild of Natural Science Illustrators was founded in 1999 to encourage and support scientific illustrators through networking, technique workshops, and public education. The New England Chapter holds three general planning meetings a year, in January, May, and September. Our meetings are typically held in Providence, RI at the Rhode Island School of Design. We are now offering virtual meeting attendance capability to those who would like to join us but are too far away to easily travel to Rhode Island. Over the course of the year, we organize sketching field trips, demonstration days, workshops, portfolio sharing and an annual exhibit. Members, their guests, and all others interested in scientific illustration are welcome to participate. The Finger Lakes Chapter is centered around Ithaca, New York, but members come from as far away as Rochester and Buffalo and northern Pennsylvania. We hold bi-monthly meetings, usually at the homes of our members. At the meetings, we share artwork, ideas, camaraderie, and expertise in a variety of media. We promote high standards of competence and ethics and discuss professional issues we face as science illustrators and artists. Not all of us are professional artists, however. We have a natural science-themed show every year and encourage all members to join these group exhibitions. Other activities include sketching at nature centers and museums, and going on field trips – a past trip included a tour and workshop at the Golden Paint factory. We periodically hold workshops for our members; we have worked with the Cornell University Botanic Gardens to bring GNSI members from other chapters to teach two-day public workshops, for example. We welcome new members! Members of the GNSI Great Plains Chapter are professional scientific illustrators and educators with an informal goal of educating and generating awareness of our unique regional Great Plains ecosystems. Through art and educational programs about the environments in the Great Plains, we encourage conservation and preservation while creating great art. We strive to make our artwork realistic, detailed and scientifically accurate while at the same time aesthetic and visually pleasing. We meet about six times a year for nature sketching, art workshops, tours of local nature or science facilities and outreach activities. At these events, we assist kids and adults in drawing nature and learning about science illustration. We sponsor member exhibits and biennial workshops with nationally recognized scientific illustrators. Anyone interested in scientific illustration is welcome to attend our meetings. The Greater New York Chapter meets regularly at the New York Botanical Garden and at other tri-state locations to discuss professional issues, tips, and techniques of interest to illustrators in a sharing environment. We offer our members lectures, demonstrations, workshops and field trips, as well as opportunities for group exhibitions. The GNSI Oregon Chapter began with an informal gathering at the GNSI Annual Conference in Richland, WA in 1999. Our main goal is to connect with other science and nature illustrators. We hold 2-3 meetings per year, all with an educational component, offering presentations and mini-workshops and visiting nature-related facilities or locations. We also coordinate member art exhibits. GNSI-Northwest has been active since 1979. Most of our members reside within the Seattle and greater Puget Sound region but some come from farther afield. Graduates from the University of Washington’s Natural Science Illustration Program make up the largest part of the membership. GNSI-Northwest connects members with art and science opportunities. We participate in outreach events, organize field trips, workshops, and exhibits and keep our membership informed of the many relevant happenings in the Seattle area. We have been volunteering at the Burke Museum at the University of Washington for a number of years and have recently joined Ocean Career Day at the Seattle Aquarium. We do not have regularly scheduled meetings at this time. GNSI-Great Lakes gatherings include lectures, workshops, exhibits and field trips. We share information, learn new techniques and network about our experiences in freelancing, exhibiting and staff positions. Recent exhibition sites include the Brushwood Center at Ryerson Woods and Fernwood Nature Center. Members can often be found sketching at the Morton Arboretum, Chicago Botanic Garden, Shedd Aquarium, and monthly at the Field Museum of Natural History. We represent a variety of experience levels from full-time scientific illustrators and educators to museum employees, scientists, and researchers. Most of our meetings are held in the Chicago area. The Greater Washington DC Chapter of the GNSI (GNSI-DC) was formed in 1997 after the 1996 National Annual Meeting in Washington DC. The national organization formed at the Smithsonian's National Museum of Natural History in 1968 and DC area members were the GNSI core organizers and directors for the organization’s first 22 years. After 1990 the GNSI Board of Directors was no longer centered in DC and our local group transformed later into an official GNSI Chapter. GNSI-DC holds meetings 4-6 times a year, usually at the Smithsonian’s Museum of Natural History. We elect a slate of officers every 2 years. After a half-hour social and a very short business meeting, an invited speaker usually presents for an hour. Speakers cover a wide range of topics including science, history, traditional and digital techniques. One or two meetings per year are devoted to weekend day-long field trips, with a potluck lunch. All persons interested in learning more about science-art are invited to attend chapter meetings. The group maintains an e-mail list and sends local meeting announcements to that list. The GNSI Maine Group is based in Bar Harbor and meets at the College of the Atlantic Dorr Natural History Museum. Throughout the year, we hold monthly field sketching and hiking events (location may vary throughout the state), as well as drawing events in the COA natural history museum and greenhouse. The GNSI Texas Group meets once a month for a sketching session in the greater Dallas/Fort Worth area, usually at a different location each time. Past field trips have included the Perot Museum of Nature and Science, the Dallas Zoo, and the Fort Worth Botanic Garden. We are expanding to include sketch trips to Austin (the Lady Bird Johnson Wildflower Center) and Houston (the Houston Museum of Natural Science). Not near a GNSI Chapter or Group? Get involved by following GNSI's Facebook page and Twitter, and by subscribing to the SciArt-L Listserv.